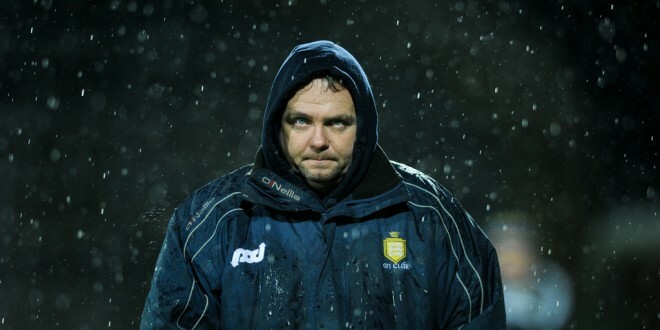 Clare manager Davy Fitzgerald heads for the dressing room after the final whistle following the loss to Tipperary in the Waterford Crystal Final at The Gaelic Grounds. Photograph by John Kelly. 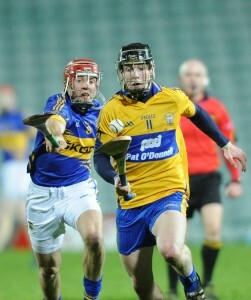 Peter Duggan of Clare in action against Conor O Brien of Tipperary during their Waterford Crystal Final at The Gaelic Grounds. Photograph by John Kelly. 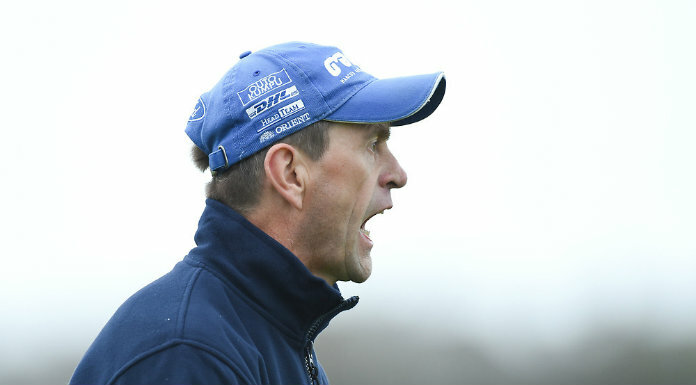 A fourteen point defeat in the week before the 2014 Allianz National hurling league gets underway will certainly have given Clare manager Davy Fitzgerald and his backroom team plenty to think about over the coming days as they finalise plans for the county’s clash with Kilkenny in Ennis next week. 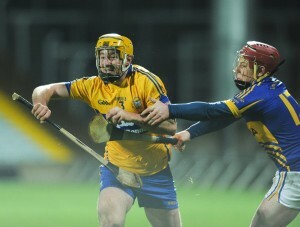 Cian Dillon of Clare in action against Kieran Morris of Tipperary during their Waterford Crystal Final at The Gaelic Grounds. Photograph by John Kelly. 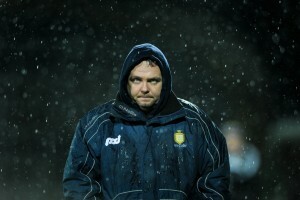 Such a comprehensive defeat from Tipperary in a repeat of last year’s final wasn’t what Clare followers expected as they headed for the Gaelic grounds in Limerick on Friday evening after the match had been switched from Sixmilebridge because of the inclement weather. 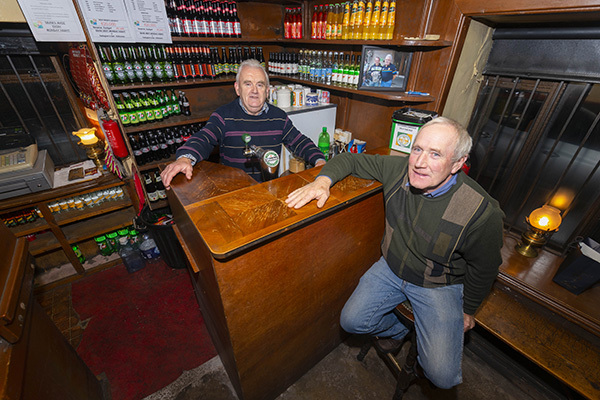 Clare’s display was well below anything they had shown since last summer and the management team will certainly have plenty to ponder on as they prepare for the Kilkenny game. Particularly disappointing for Clare fans in the attendance of 1,248, was the manner in which Clare’s challenge faded when Tipperary stepped up a gear after half time. 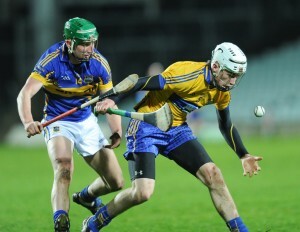 Conor Cleary of Clare in action against Conor Kenny of Tipperary during their Waterford Crystal Final at The Gaelic Grounds. Photograph by John Kelly. With the exception of a period in the second quarter on Friday, Tipperary were the sharper and hungrier side and emerged as deserving winners of the title for the fourth time since the competition was inaugurated nine years ago. This was a reverse of last year’s final played at Thurles when Clare showed the greater sharpness and hunger for victory. This time the premier side were the sharper outfit. 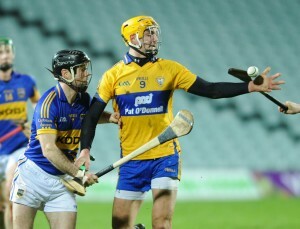 Tony Kelly of Clare in action against James Woodlock of Tipperary during their Waterford Crystal Final at The Gaelic Grounds. Photograph by John Kelly. Ahead by a point at half time after playing against the breeze, things looked good for Clare but Tipperary stepped up a gear on the resumption and goals from Conor Kenny and two from Denis Maher ensured victory. When Tipperary opened a five point lead by the mid point of the first half, a surprise looked to be on the cards. However, three Clare goals in a five minute spell from John Conlon, Tony Kelly and Conor McGrath saw the title holders take the lead and at half time, despite having played against the breeze, they held a one point advantage, 3-5 to 1-10.